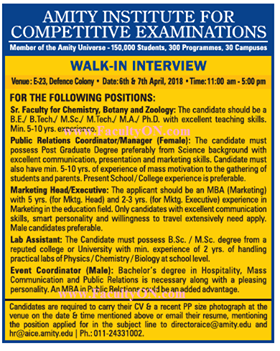 Amity Institute for Competitive Examinations, New Delhi has advertised in THE TIMES OF INDIA for the recruitment of Sr Faculty plus Manager job vacancies. Interested and eligible job aspirants are requested to appear walk in on 7th April 2018. Check out further more details below. About College: AICE is a futuristic vision of Amity Universe, established in the year 2000 to thoroughly equip students to excel competitive exams. Diversifying its vision and objectives with competitive requirements, the institute primarily aims to enhance the knowledge base of students by developing their analytical skills, reasoning and logical acumen, thereby giving them the winning edge over others. How to Apply: Interested and Eligible candidates may bring their resume along with copies of certificates and recent passport size photograph to the following address on 7th April 2018 from 11.00 am. Candidates may also mail their resume.